Clear crystals are similar to transparent glass offering properties of translucence and light refraction. Transparency allows one the clarity to see through things. Clear visibility allows a greater or larger view perspective resulting in more information to be seen and processed. Clear crystals offer an energetic vessel for transformation and self-understanding to take place on all levels. Clear crystals, much like windows, provide a source of energetic insulation and psychic protection while we look through a portal to see what’s on the other side. Clear crystals allow for the light to shine through resulting in moments of illumination, expansion, and growth. Illumination from clear crystals energetically connects with the divine and awakens one to the truth of self, giving insight and personal revelation as to who we really are and why we are here. Clear crystals energetically lift the veil shrouding viewpoints of a limited, perceived reality. With more light available, our energetic vibrations are lifted and open us to soulful purpose, people with higher vibrations, divine manifestation, and spiritual guidance. Clear crystals enhance creativity which energetically vibrates and ripples out to attract the higher frequencies of inspiration, supportive like-minded individuals, and the physical realization of manifestation for the highest good. Illumination from clear crystals offer solutions to problems with greater insight and understanding of potential obstacles. 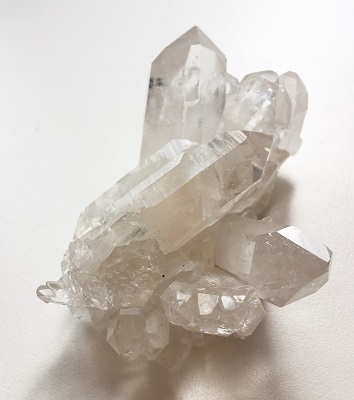 In healing, clear crystal’s ability to raise light vibrations moves stagnant, dense energies into a beneficial flow preventing dis-ease and self-limiting beliefs. Beautiful Clear Quartz Crystal Polished Skull carving. Beautiful ethereal Faden Quartz Crystal from Pakistan. Beautiful Faden Quartz Crystal from Pakistan. Beautiful Faden Quartz Crystal Cluster from Tole, Wana, South Waziristan, Pakistan. Beautiful icy clear Quartz Crystal Cluster with cross, self-healed, and time link configurations from Arkansas, USA. Beautiful Clear Quartz Crystal Cluster from Arkansas, USA. Natural Shaman Quartz Crystal with mineral inclusions of Chlorite, Fluorite, Phantoms, Rutile, Hematite and Mica from Brazil. Burgundy and cream colored hand-dyed silk ribbons wrap around a natural Selenite blade topped by a magical unicorn. Shades of autumn browns and gold hand-dyed silk ribbons and leather wrap around a natural Selenite Crystal wand topped by feathers, carnelian and a rustic brown feather pendant. Nice hand sized Tibetan Black Spot Quartz Scepter Crystal Point with black spot inclusions, interesting pockets, and key configurations. Fun contrasting bright colored orange and deep purple hand-dyed silk ribbons wrap around a clear Natural Selenite Crystal wand adorned with black duck feathers and amethyst crystal slices. Translucent blueish-grey milky white colored Girasol quartz pig totem carving with pinkish internal flashes. Fun contrasting bright colored orange and deep purple hand-dyed silk ribbons wrap around an icy clear Natural Selenite Crystal wand adorned with orange tipped pheasant feathers and a crystal chunk of Carnelian.